For other uses, see Aslan (disambiguation). 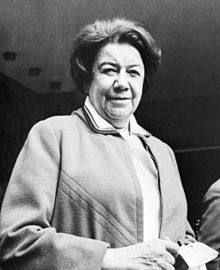 Ana Aslan (Romanian pronunciation: [ˈana asˈlan]; 1 January 1897 – 20 May 1988) was a Romanian biologist and physician who discovered the anti-aging effects of procaine, based on the drugs Gerovital H3 and Aslavital, which she developed. She is considered to be a pioneer of gerontology and geriatrics in Romania. In 1952, she founded the Geriatric Institute of Bucharest. This institute was the first of its kind in the world and was recognized by the World Health Organization. Although her work was controversial, it received international attention. Ana was the youngest of four children, two brothers and two sisters, born to Margarit and Sofia Aslan. Ana was said to be a very intellectual child, learning to read and write already by age four. At the age of 13, her father died, and her family then moved to Bucharest, Romania. It was in Bucharest where she began her studies. She graduated from the Central School of Bucharest in 1915. The premature death of her father, whom she was close to, was said to be the reason she wanted to become a physician. Although the medical field was not a desirable field for women to enter, Ana Aslan decided that was the path she wanted to pursue and attended the Faculty of Medicine from 1915 to 1922. Her mother did not support this decision of becoming a physician because of financial strains, so Ana Aslan went on a hunger strike until her mother accepted her medical career. During her time in undergraduate studies, she attended to soldiers as a nurse during the First World War. After graduating from the Faculty of Medicine in 1922, she began working with Daniel Danielopolu who supervised her doctoral thesis. She obtained her M.D. degree in cardiovascular physiology in 1924. Her focus was on physiology and the process of aging. While experimenting on the effects that procaine had on arthritis, Aslan discovered other beneficial effects of this drug. It was this discovery that led to a three-year study and eventual invention of her drug called Gerovital (H3), which she prescribed for the effects of aging. With hesitation from fellow scientists that Gerovital was a “fountain of youth”, Aslan kicked off a research study to prove the results. Over a period of two years, blood samples were taken from 15,000 people, with some of them receiving Gerovital and some receiving a placebo. 40% of the people who took Gerovital had less sick-leave days, and mortality rate from the flu epidemic was 13% in placebo patients while only being 2.7% in patients who took the drug. In 1976, with a pharmacist named Elena Polovrăgeanu, they invented another drug named Aslavital, which was a similar drug to Gerovital aimed to delay the skin aging process. While investigating the pain-relieving effects of procaine in patients with arthritis, Ana Aslan discovered that the drug also produced other beneficial effects, such as an improvement of skin and hair aspect, better memory, and a general feeling of well-being. Based on this discovery, she developed the anti-aging drug Gerovital H3 (1952). Later, together with Elena Polovrăgeanu, she created an improved formula marketed as Aslavital (1961). The beneficial effects of Gerovital have been scientifically recognized. However, some studies have failed to replicate the anti-aging effects (see main article). Gerovital is currently banned in the U.S. by the FDA as an "unapproved new drug". Ana Aslan patented two cosmetic products (hair lotion and cream Gerovital H3), entrusting their production to Farmec company and Miraj. The two companies have since diversified their range of cosmetics, and traditional procaine hydrochloride was eliminated from the formula. Ana Aslan was considered a pioneer of social medicine. Years after becoming the head of the physiology department at the Institute of Endocrinology of Bucharest, she founded the Institute of Geriatrics of Bucharest. Ana Aslan is known for coining the term “gerontology”, and in 1959 organized the Romanian Society of Gerontology and Geriatrics. The Romanian Society of Gerontology was the first in the world to channel its research into clinic, experimental, and social researches, devise a therapeutic strategy to prevent the process of aging, and organize and national health network for the prevention of aging. Her drug was used by many famous politicians and celebrities around the world, including John F. Kennedy. ^ Dumitrascu, D. L.; Shampo, M. A.; Kyle, R. A. (1998). "Ana Aslan—founder of the first Institute of Geriatrics". Mayo Clinic Proceedings. 73 (10): 960. doi:10.4065/73.10.960. PMID 9787745. ^ Parhon, C. I., & Aslan, A. (1955). Novocaina; factor eutrofic şi întineritor în tratamentul profilactic şi curativ al bătrînetii. Editura Academiei Republicii Populare Romîne. ^ Dean, W. (2001). DMAE and PABA—An alternative to Gerovital (GH3), the "Romanian Youth Drug". Vitamin Research News, 15, 9. ^ Kapoor, V. K.; Dureja, J; Chadha, R (2009). "Synthetic drugs with anti-ageing effects". Drug Discovery Today. 14 (17–18): 899–904. doi:10.1016/j.drudis.2009.07.006. PMID 19638318. ^ Branciulescu, Adina Elixirul Anei Aslan, National Geographic Romania. Wikimedia Commons has media related to Ana Aslan. This page was last edited on 21 January 2019, at 13:57 (UTC).